I have never been to Disneyland, but apparently there are mermaids to be seen there! This is a video of a pair of mermaids hanging out in the pool at the Disneyland hotel. Not only are there mermaids there now, but there have been mermaids there for some time! Here is some family’s home video of their 1964 trip to Disneyland. The mermaids are at 1:34 if you don’t feel like watching the whole thing. Gnome Chompsky (a play on the name Noam Chomsky) is a garden gnome that played a small part in the computer games Half Life 2: Episode 2 and Left 4 Dead 2, both are sci- fi first person shooters. Gnome Chompski was originally found in the 2007 game Half Life 2: Episode 2. Known then as the Garden Gnome, it had to be carried throughout the length of the game in order for the player to earn the “Little Rocket Man” achievement. 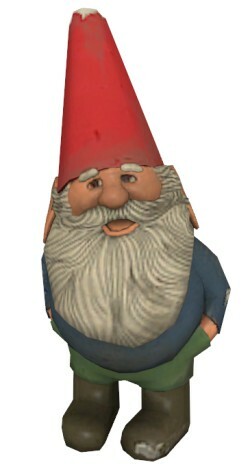 The Gnome then reappeared in the 2009 game Left 4 Dead 2 where he was given the name Gnome Chompski. On this occasion he had to be carried though the Dark Carnival campaign, which was easier, but still a bit tricky. With the release of the DLC “The Passing” in 2010, it brought with it a set a mini game modes. When the fourth one, “Last Gnome on Earth” was released, this image was released on the official Left 4 Dead Blog. I have not played either Half Life 2 or Left 4 Dead 2, so I do not know this little guy from actually playing the games. I found out about him because of a fan vid promoting a non-existent computer game, that looks like it would be pretty fun to play.